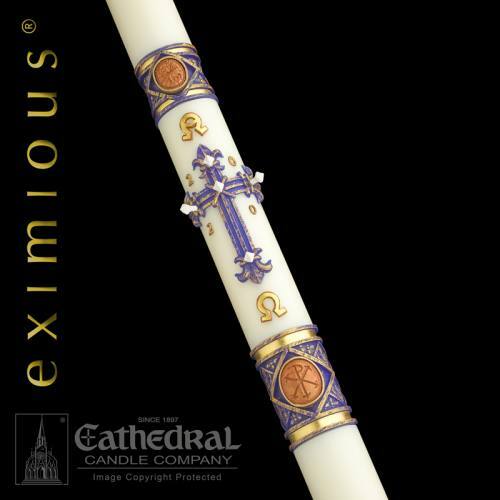 Featuring a handsome fleur-de-lis cross, the Lilium Paschal Candle renders this ancient symbol of the Holy Trinity in an exquisite royal blue and gold color scheme. Ornamental bands with bronze medallions of the Agnus Dei and Chi Rho monogram of our Lord are beautifully adorned with bees - a noble symbol of sacrifice celebrated in the Easter Exsultet. Individually hand-crafted, each Lilium candle is a truly majestic celebration of the Resurrection of our Lord and the gift of eternal life. 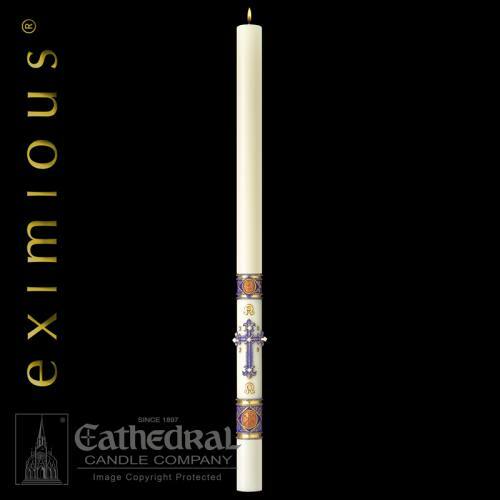 ​All Eximious candles are made to order; minimum lead-time for shipping orders is four weeks from receipt of order. Easter Sunday is April 21, 2019. The latest date an order can be placed for guaranteed Easter 2019 delivery is Thursday March 21, 2019. Custom Paschal Candles are also available. Please contact us at (800) 743-7155 for more information. Complementing Altar Candles are also available.